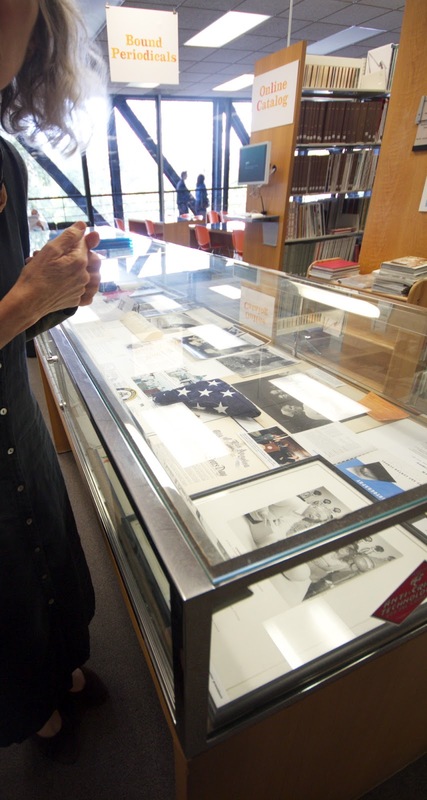 This library exhibition space showcases a regularly rotating display curated mostly by library staff. It is can be requested for events by faculty and students. Described as a war hero, this highly regarded educator was a combat photographer during WW2, and shot the Japanese surrender on the USS Missouri. He then went on to (perhaps even more impressively) teach at the Art Center College of Design for 47 years. This exhibition was collected and curated by a former student of his James Caccavo, who also went on to include combat photography in an impressive photographic career. Included in this collection of papers, awards and photos are most of the cameras Mr Potts used in his practice. The submission process for the space is fairly loose with no committee or formal guidelines. They have never rejected a submission. Exhibitions often link with soft events: talks and presentations in the library of an afternoon during library hours. There really were broad physical and cultural differences between library exhibiting spaces in the colleges of the US and the Library Stairwell Gallery of the National Art School Library in Sydney. The Library Stairwell Gallery [LSG] at NAS is the only dedicated student exhibiting space on campus and the opportunity to show there is contested heartily through the year. The Library Stairwell Gallery Committee is made up of heads and representatives from all departments (Drawing, Art History and Theory, Painting, Sculpture, Photography, Printmaking and Ceramics) as well as the Library, and the exhibitions feed in to professional development aspects of the curriculum. Shows are mostly curated by students, and the space is managed by Library staff. Another driving force behind the energy of the NAS LSG exhibition space, I have to admit, is the scope for opening events. The LSG floor plan is such that the library proper can be locked at closing and the external doors of the exhibiting space swung wide for the opening party, with it's accompanying hors doevres and mediocre wine. This separation, producing a stand-alone gallery within the backbone of the library is invaluable indeed. Apart from layout, another fortuitous element in the LSG's success are refreshments. With the American drinking age at 21 most college students can't drink- at least not legally, and certainly not on campus. Many agree there are few better ways to legitimise an exhibition opening as a bona fide event than via a glass of red. The opportunity to celebrate, and toast, the culmination of producing and curating work, catalogues, invitations, wrangling the hang and planning the bump out is taken seriously by exhibiting LSG artists. A teeming throng of friends and family, fellow students, alumni and various art-world reprobates and renegades attend. Lecturing staff spend time socially with their pupils and talk about practice outside the formal teaching/studio setting. With custom and architecture on our side, a fine time is had by all at the Library Stairwell Gallery openings. Especially by the art-show-butterfly library staff.